Are a four-cylinder front-driven hot-hatch and a straight-six turbocharged BMW really fighting for the same audience? You can read on to find out but if a Megane is on your shopping list it can't have escaped your attention that it's not that much further to stretch to an M135i. Worth it though? And is rear-wheel drive really the be-all, end-all? If any car can challenge that assertion it's the Megane. The BMW is too nuanced to boil this down to a simple case of blunt weapon versus sharpened blade, tempting as it may be. 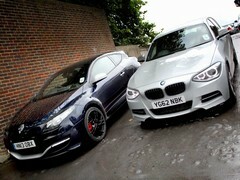 On the numbers the BMW is clearly packing a heavier punch than the Megane but it's also carrying 121kg more. By the numbers the BMW is decisively the quicker machine though, subjectively and objectively. 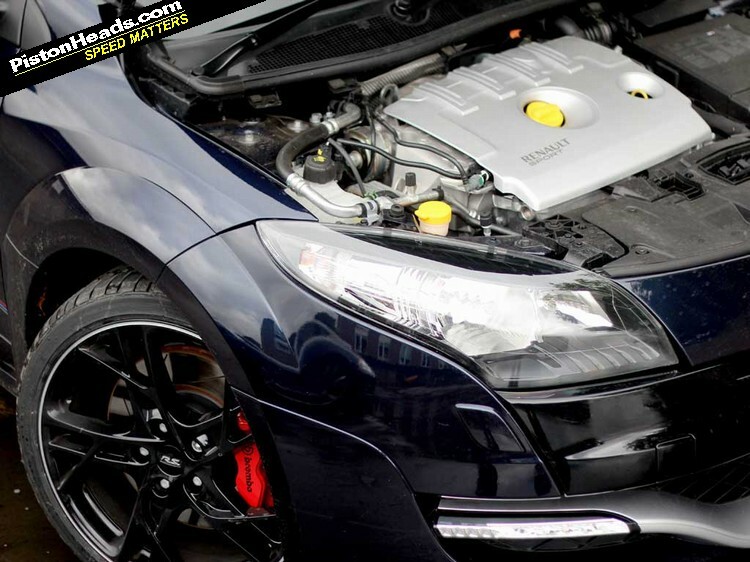 Peak torque comes in at 1,500rpm on the BMW, 3,000rpm on the Renault, meaning you have to be up in the revs on the Megane for it to really come alive. But the BMW's got top end too, and a more charismatic sound once there meaning there's incentive to explore life beyond the torque band. Then there's the question of the driven wheels. The Megane might put its power through the front but with the optional diff it makes much more of its traction through and out of the corners than the BMW, whose lack of an LSD means it too often spins away its power advantage through its unladen wheel and subsequent intervention, be that you or the electronics. 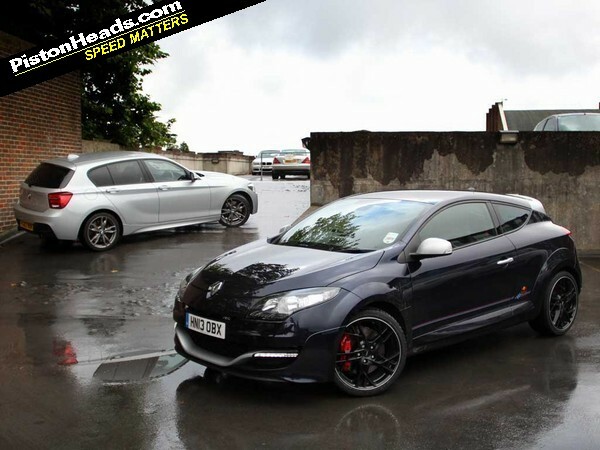 In the wet the Megane is an absolute weapon too, clawing at the tarmac where the BMW scrabbles for traction. 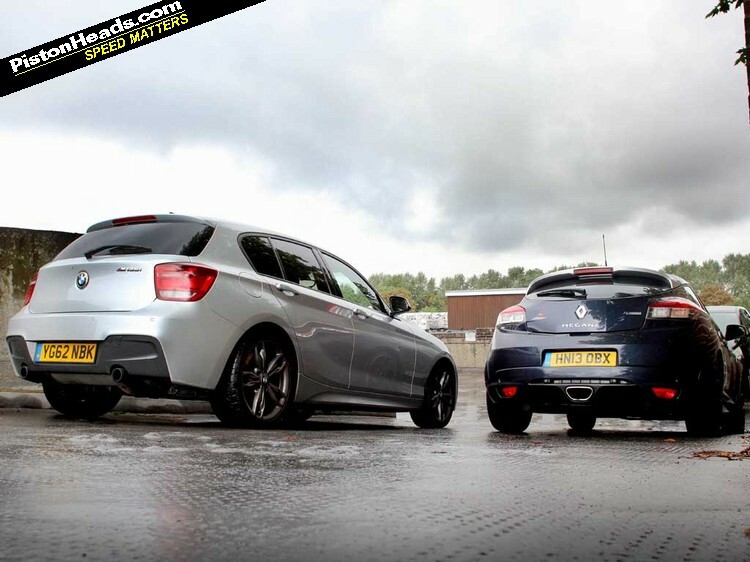 The M135i feels fast but stodgy in comparison to the Megane, which is always on its toes and spoiling for a fight, the knife-edge chassis much more exploitable than a front-driven car has any right to be. And it just gets better the harder you push it. On a motorway the BMW rules supreme but on a slithery winter B-road the Megane will leave it standing. Basically the BMW is fabulous up to about eight tenths while the Megane only really comes to life and shows its class in the final two. Where you pitch your driving tastes - or requirements - should be the ultimate deciding factor. In the BMW it's that ability to feel as cosseting as a downsized 5 Series on a dreary motorway commute and then morph into a pint-sized muscle hatch at the press of a button from Eco Pro to Sport Plus. There are few driving situations where the BMW doesn't punch way above its weight and few 'normal' cars are going to leave it standing. The Renault makes you work harder for your thrills and is more single-minded in its approach. In the BMW you have modes to suit your mood. In the Megane it's maximum attack all the time and up to you to play along. When the road, moment and appetite converge it's exceptional. On a bumpy high street, when you're not feeling it, less so. Four-cylinders and FWD a knife to a gun fight? If badge snobbery and the spec sheet stats matter to you then there's really no contest here - the BMW hammers the Renault on prestige and bald performance numbers. And the traditional appeal of the rear-driven chassis - rare in this price bracket - probably seals it for the purist driver brigade too. But if you're willing to look beyond status and numbers the Megane has the pedigree and ability that go far beyond its more humble roots. And on a track it's the real deal. 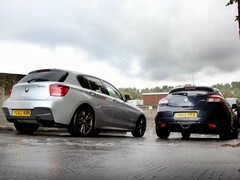 To compare like with like you'd really want a three-door M135i rather than 'our' five-door. On pure practicality terms neither car is especially accommodating of anyone other than the driver and front-seat passenger. Space in the back of both is limited for full-size people, though fine for kids. The Renault has a bigger boot, though hampered by a small load hatch and tall sill, the five-door and auto options for the BMW opening up the scope to those who need a more all-round machine. 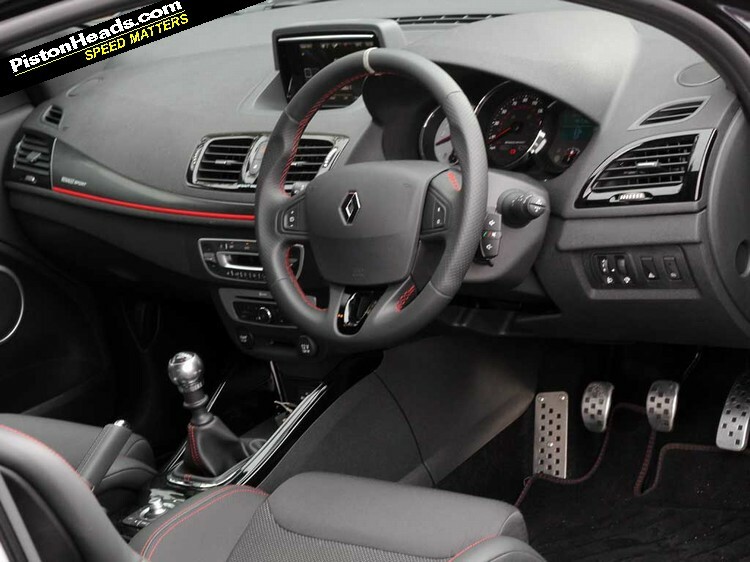 The BMW's slick controls, glitzy navigation and cool, minimalist interior all feel from a class above the Renault. But the Megane counters with a sense of fun from the upgraded Renaultsport Monitor, the grippy Recaros and brilliantly harmonised controls. Perhaps not at first glance. 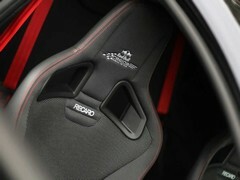 The Megane starts at £25,545 for the Cup, rising to £26,745 for the 'full fat' and £28,245 for the special edition RB8 here. The BMW kicks off at £30,570 for a manual five-door, £31,100 for a five-door. 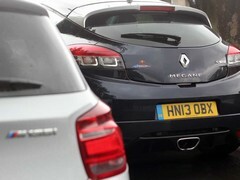 As tested (see below for full details) the Megane weighs in at £29,370 while our carefully optioned Cup that we ran as a PH Fleet car not so long ago came in at £28,115. On paper then you're looking at a near 10-grand price leap to a specced up M135i. They don't call BMW a 'premium' brand for nothing, though the six-cylinder motor and power advantage do make the pill easier to swallow. Recaros or plump red leather? Seats say much! As we're finding out, BMW dealers seem to be reasonably malleable on M135i pricing, with PHers reporting low 30s and even high 20s being enough to secure sensibly specced cars with all the toys you'd reasonably want. That's pretty depressing reading if you're trying to make a financial case for the Renault, though our colleagues at What Car? 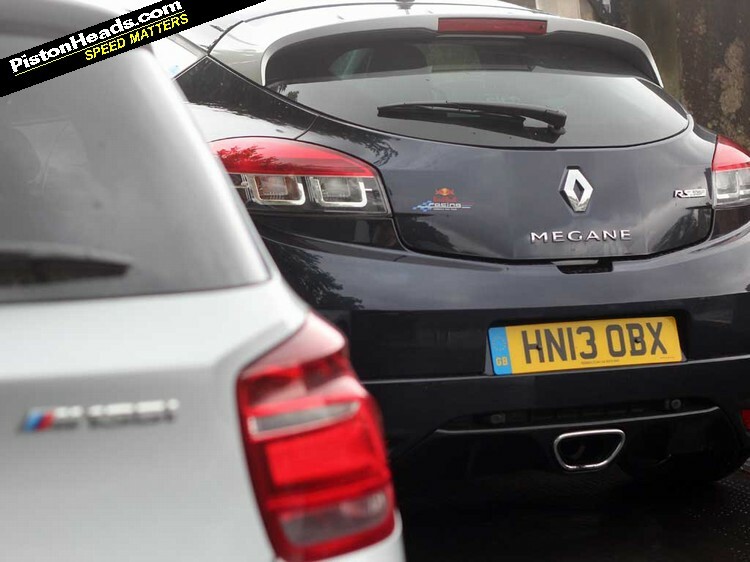 put the standard Megane's target price at £22,289 against the £28,137 for a three-door M135i by the same measure. We need to split this conclusion in two really. By the numbers it's hard to see how the Renaultsport can really offer much of a challenge to the M135i's awesome package of ability and value for money. The BMW wins on quality, comfort, badge appeal and raw speed. But this is PH. And, hopefully, our car buying decisions aren't entirely dictated by cold, hard logic. And as a pure driver's machine the Megane pours scorn over it's supposed 'wrong-wheel drive' format, more humble four-cylinder powertrain and hatchback roots. This is an exceptional driver's car that really comes into its own just as the BMW's hugely impressive 'real world' abilities and easy-win performance starts to fade. Best buy? It's got to be the BMW. But the ultimate driving machine? That'll be the Megane. This thread may contains random views, pointless arguments and crazy counter points, mixed in with cheap straw-man arguments with a covering of RWD+FWD arguments rehashed for the hundredth time. However.. saying that.. its Friday.. Start you engines.. In our next report we compare the M135i with a Mazda Bongo Friendee with wood effect steering wheel! Two fast, well regarded hatches. I'll take the BM please. What I find incredible about these cars is that they are putting out less CO2 than my 10 year old 3 litre diesel! Especially in the case of the BMW. Two awesome cars, I'd be happy with either but would go with the BMW, simply as it has the correct compliment of cylinders and I prefer RWD.